Weekends are for errands and long walks and lounging with a pot of tea. And for big breakfasts. This weekend, I decided I’d make myself and Boyfriend a full English breakfast. 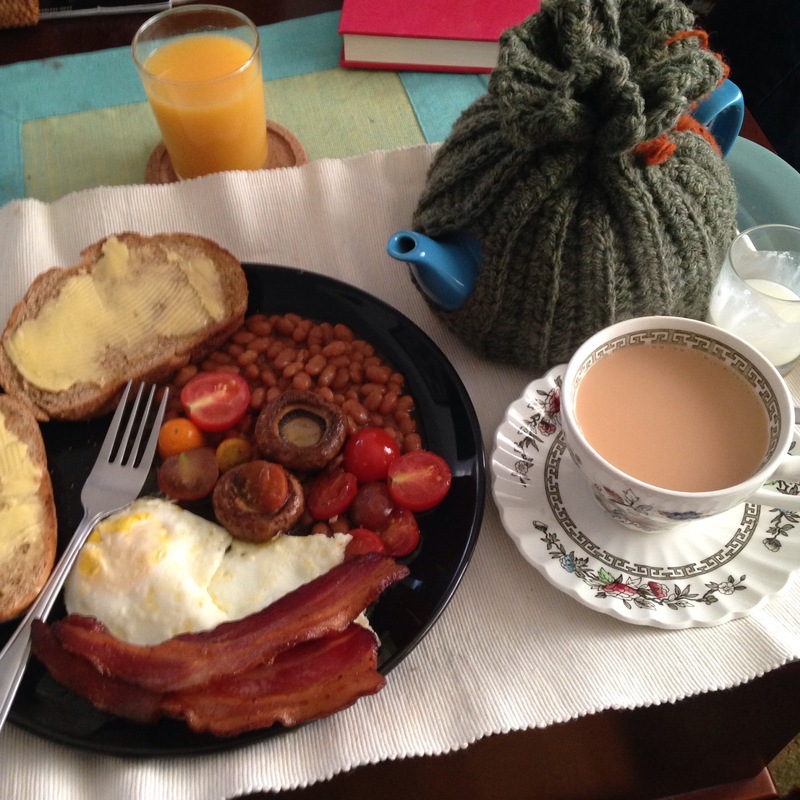 An English breakfast consists of bacon and eggs and toast, but also grilled mushrooms and tomatoes, and a pool of baked beans. And it is washed down with copious amounts of strong black tea. I had mine with a little milk. Often, it includes sausage links as well as bacon, but I decided to limit myself to one breakfast meat. Our Saturday morning was wonderful. I dragged him out of bed a little after 8 a.m., to bundle up for a walk around the lake near our house. I wrapped up in fleece leggings, a long skirt, a thick cabled wool sweater, my vest, a scarf, my boots, and my crocheted ear warmer and found myself toasty warm, other than a bit of nip at my nose. It was chilly and clear and very quiet. There were a few runners out. Even some of the geese were still sleeping. Boyfriend was not too pleased to be up and about at that hour, but it was a lovely start to the day. And I knew he would appreciate what we had in store for us when we got home. When I got home, I threw the rashers of bacon in the oven to bake. I got a pack of nice thick-cut bacon from a local farmer. Eggs, tomatoes, mushrooms, butter, and milk were all also from nearby farmers, and I had a loaf of homemade bread in the freezer. I tipped the tin of beans into a small saucepan and put it on a low flame to warm up while the bacon cooked, and washed up the veggies. When the bacon started getting sizzly, I started frying up the mushrooms and then tomatoes, and turned the beans up a touch so they started to bubble. I toasted the bread and spread it with plenty of butter. And lastly, the eggs went in the pan to cook gently in some butter. While all this went on, I boiled the electric kettle and made a pot of Assam tea and laid out my tea tray. Everything came together beautifully, and by shortly after 10, we had our plates. I poured some tiny glasses of orange juice because Boyfriend likes it, and I thought a small glass could do me some good in the dead of winter. We devoured our breakfasts, some of us faster than others, and I sat and sipped tea and finished The Secret Adversary, which I’d started the day before. By the time it hit noon, I felt invigorated with the walk and sustained with food and tea and was ready to run some holiday errands!